Another Yggdrasil jackpot slot rewards a Vera&John casino player with 38,621 in cash thanks to one lucky spin of the reels. There’s only a few Yggdrasil games with jackpots, and even then there’s only two with sums that reach in to the millions like NetEntertainment’s Mega Fortune Dreams and Microgaming’s Mega Moolah. 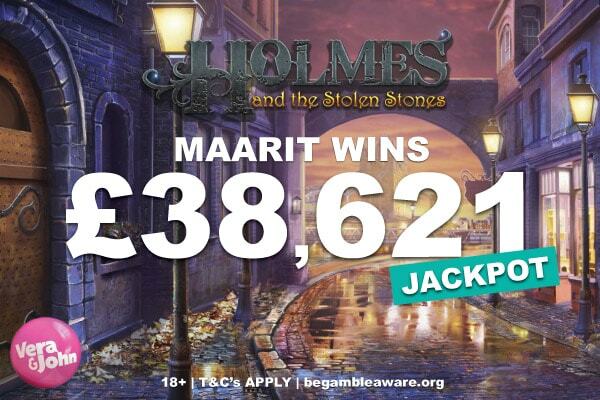 This however is not a story about one of the huge millionaire making jackpots, instead it’s one about the Holmes and the Stolen Stones slot machine and Maarit who managed to win one its five progressive jackpots. Here’s how she won, her reaction to the win and of course a little more about the winning casino slot. Winning a jackpot is not usually elementary, however, when Maarit opened up her favourite slot machine at Vera&John and started spinning, it seems she had all the answers the game was looking for. She was happily spinning secretly hoping that one of the games five jackpots would hit and dreaming of all the things she could buy, when it happened. Finally this elusive slot gave away too many clues and on a single spin Maarit managed to trigger the free spins games and fill the jackpot meter at the top of the reels. It was then she won one of the progressive jackpots and was instantly rewarded with £38,621 in her Vera&John account. Well before we find out what she plans on doing with her new mini fortune lets find out more about her favourite slot. You can of course read our full Holmes and the Stolen Stones slot review if you want to find out every little detail about how this Yggdrasil game plays online and mobile. Essentially it’s your typical low variance slot machine with free spins and jackpot, however unlike many others the theoretical return to player rate is higher at a decent 96.8% compared to NetEnt’s Hall of Gods slot for instance which is down at 95.5%. Taking inspiration from the infamous British detective this video slot lets you pick crates to win instant cash prizes and collect gem stones to trigger the free spins. 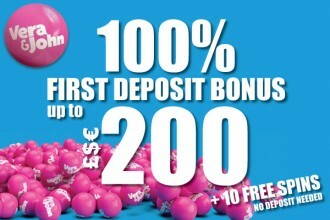 It’s fun with some decent base game wins to be had and of course some big jackpot prizes too. What does Maarit plan on spending her casino winnings on? Being not one to sit on her laurels, Maarit has already gone shopping for a few things including some new furniture. She’s also paid off her car and plans on putting the rest in to her bank to save for some extra cash splashing times in the future. With only one month to go before Christmas there’s surely going to be some happy festivities ahead too for her, family, and friends. Vera&John casino online like to celebrate their players wins. With many players in the past enjoying wins on games from lots of their different providers. As you can see they aren’t the huge over a million style wins that one player at LeoVegas casino enjoyed thank’s to Yggdrasil’s Joker Millions slot, but still big enough amounts to help peoples lives. If you’re after one of the best casinos in the business and enjoy playing whether you’re from the UK, Sweden, Norway, Finland, New Zealand or in between then it’s worth a look. Who knows, you might be the next lucky player to feature in one of our big slot winner stories.